Info "When it's your turn, raise and lower your arms! Mess up and endure the wrath of the mob!" Fitting In is one of Kat and Ana's microgames in WarioWare: Smooth Moves. The player controls a Tiki head. 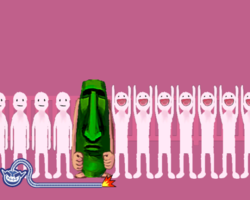 The player must raise or lower the Tiki's arms in rhythm to the line of the other people. 1st level difficulty: The player will have plenty of time to react. 2nd level difficulty: The player will have less time to react. 3rd level difficulty: The player will have to raise their arms, and then the line will go in reverse lowering the arms. The player must then lower their arms. This page was last edited on September 14, 2018, at 09:16.